This antibody reacts with the heavy chain present in all types of human IgM. Our Abpromise guarantee covers the use of ab17104 in the following tested applications. IHC-P 1/25 - 1/50. 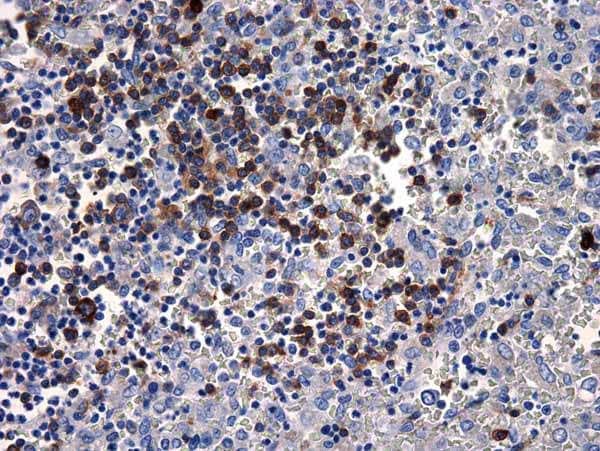 Perform enzymatic antigen retrieval before commencing with IHC staining protocol. 1/25 - 1/50 in an ABC method. We suggest an incubation period of 30 minutes at room temperature. IgM normally constitutes about 10% of serum immunoglobulins. IgM antibody is prominent in early immune responses to most antigens and is largely confined to plasma due to it's large size. Monomeric IgM is expressed as a membrane bound antibody on the surface of B cells and as a pentamer when secreted by plasma cells. Due to it's high valency IgM is more efficient than other isotypes is binding antigens with repeating epitopes (virus particles and red blood cells) and is more efficient than IgG in activiating the complement pathway. The gene for the mu constant region contains four domains separated by short intervening sequences. IgM measurement yields information about the body's immediate resistance and response to infection as well as information related to specific diseases. Decreased levels are associated with immune deficiency states, hereditary deficiencies, and myeloma. Increased levels can be associated with Waldenstrom's macroglobulinemia, chronic infection and hepatocellular disease. Immunohistochemical analysis of formalin-fixed paraffin-embedded human spleen tissue sections, labelling IgM with ab17104. ab17104 has not yet been referenced specifically in any publications. Publishing research using ab17104? Please let us know so that we can cite the reference in this datasheet. There are currently no Customer reviews or Questions for ab17104.